Cricket big shot who tried to play out 89 million ... caught red-handed! 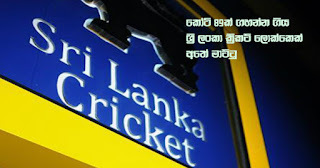 A complaint has been lodged with Financial Crimes Investigation Department regarding a fraud by an official of Sri Lanka Cricket amounting to 5.5 million American dollars and to deposit it in an overseas bank received by Sri Lanka Cricket institution in respect of the sale of rupavahini rights to 'Sony International' institution in connection with the forthcoming Sri Lanka - England Cricket tournament, it is reported. rupees) to be credited to Sri Lanka Cricket institution is to be credited to a different foreign account operated on a personal basis has come to the attention of Mr. Ashley de Silva, chief executive officer of Sri Lankan Cricket. As such, the chief executive officer who went into immediate action had informed about this to Mr. Kamal Padmasiri who is in charge of Cricket authority of the Sports Ministry regarding Sri Lanka Cricket administration and also Sports Minister Mr. Faizer Mustapha. Minister Mustapha had then ordered chief executive Mr. Silva to make a complaint in this connection to Financial Crimes Investigation Department. Accordingly, last morning (10) a complaint had been made to Financial Crimes Investigation Department and as such investigation procedures are already underway, it is reported. Under these circumstances where investigations are underway on a high-scale fraud is being probed, Sri Lanka Cricket Board has has sealed the financial section, it is understood. Whatever it is, we questioned Sri Lanka Cricket chief executive officer Mr. Ashley de Silva in this respect yesterday and what he said was that no such action of that nature has been taken and that financial activities are in operation as usual. Mr. de Silva however said that only the office where the suspected officer works has been sealed. "No sooner I came to know about this I informed the Sports Ministry. On instructions of the minister I made a complaint to the FCID. Accordingly investigations are now on. Not all people here are to be accused simply because of of a blunder made by one or two. We also are making inquiries in relevance to this incident. For that purpose Ayesh Weerakkody and Kanishka have been assigned. According to their report we the management committee would get together and come to a decision. A high-ranking officer of the financial division who has been accused in this connection had not reported to duty yesterday. It was he who was in operation of financial activities concerning rights of broadcasting of matches of rupavahini. We have enough evidence to say that he is responsible for this serious fraud. as such it would not be difficult to track the genuine fraudsters".